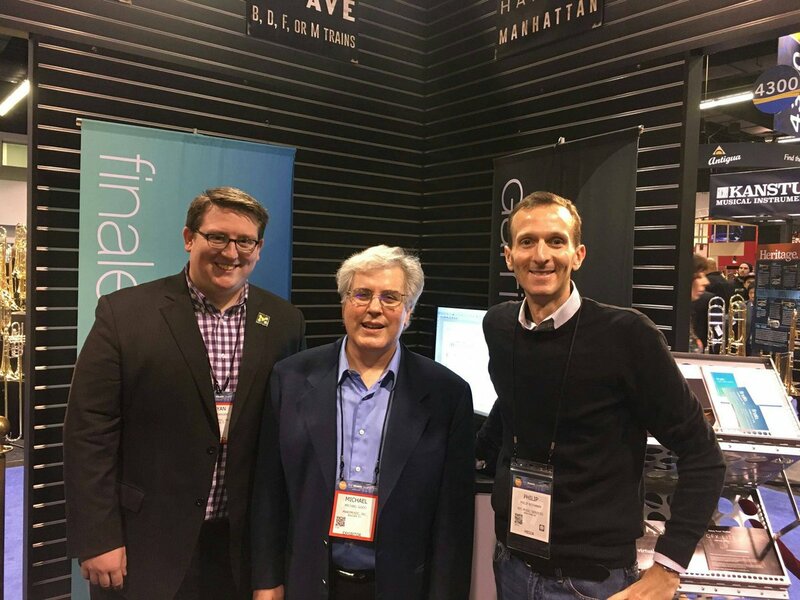 MusicXML has played a critical role in the launch and development of MakeMusic’s new web-based SmartMusic music practice software. While the classic version of SmartMusic for desktops and iPad uses Finale technology for its music notation display, the new web-based version uses different technology designed for web applications. MakeMusic uses MusicXML to ensure that repertoire is available in both the new and classic versions of SmartMusic. Since new SmartMusic launched in December 2016 after a limited early release, teachers have been able to upload MusicXML files and assign them to students to supplement SmartMusic’s built-in repertoire. Unlike classic SmartMusic, these music uploads no longer need to be created in Finale. Instead, they can be created in Finale or another other music notation program that exports MusicXML files – which is just about all of them. Last January, we improved the import process by adding an online notation editor to SmartMusic educator subscriptions. This beta application let you edit MusicXML files that you imported before assigning them to students, or create new music for your students directly in your web browser. It also let you import full MusicXML scores as well as individual MusicXML parts. However, the MusicXML support was still for import only. Scores that you created or edited with SmartMusic could not be taken back to Finale or used in other applications. That changed yesterday with the release of SmartMusic’s Sight Reading Builder and Compose applications. Sight Reading Builder lets you instantly generate an infinite number of sight reading exercises, custom tailored for your ensembles. The Compose notation editor is now a full-fledged part of SmartMusic, no longer in beta mode. Both applications are included in SmartMusic premium educator subscriptions, and both applications now let you export MusicXML files. This is a big breakthrough for both MakeMusic and our customers. MakeMusic now has two notation editors using different technologies developed for different needs. Musical scores created in either application can now be freely moved back and forth between these two applications with very high accuracy. Of course this exchange extends to over 200 other applications that support the MusicXML format. We believe that educators will find that SmartMusic’s two-way MusicXML support makes it easier to get your own custom repertoire to your students. If you have issues using the MusicXML features in the Compose and Sight Reading Builder tools, please let us know through the SmartMusic Help Center. 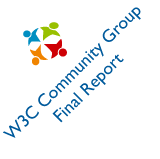 Last week the W3C Music Notation Community Group published MusicXML Version 3.1 as a W3C Community Group Final Report. This is the Community Group’s first report, and the first update to MusicXML since the Version 3.0 release 6 years ago. You can read more about the updates to MusicXML 3.1 in the Community Group Report and the GitHub issue list. We have updated the MusicXML web site for the MusicXML 3.1 release, including the tutorial, alphabetical index, and musical examples. We have also updated the community publications and music pages to include the MusicXML projects discussed at the latest International Society for Music Information Retrieval (ISMIR) Conference. 2017 has been a productive year for the MusicXML community, the W3C Music Notation Community Group, and MakeMusic’s MusicXML development. MusicXML is now supported by more than 230 applications worldwide. ISMIR 2017 shows that MusicXML is being used more frequently than ever in music information retrieval and musicology research. We wish everyone in the MusicXML community a happy holiday season and new year. Today MakeMusic released Finale 25.5 and an updated Dolet 7.1 for Finale plug-in. These updates improve Finale’s MusicXML 3.1 support to match the latest MusicXML 3.1 version from the W3C Music Notation Community Group. Measure number text is now exported for multi-movement pieces where measure numbers are reused, as well as other situations involving more complex use of measure number regions. Buzz rolls and unmeasured tremolos are now supported. Line lengths are now supported for doit, falloff, scoop, and plop elements. Finale expressions with a mix of text and musical symbols from any Finale built-in font (not just Maestro) are now supported. Grace cue notes are now supported. Image height and width attributes are now supported, for better transfer of scaled bitmap graphics. More percussion pictograms and other music symbols are now supported. Files without any measure number regions now correctly export that measure numbers are not displayed. 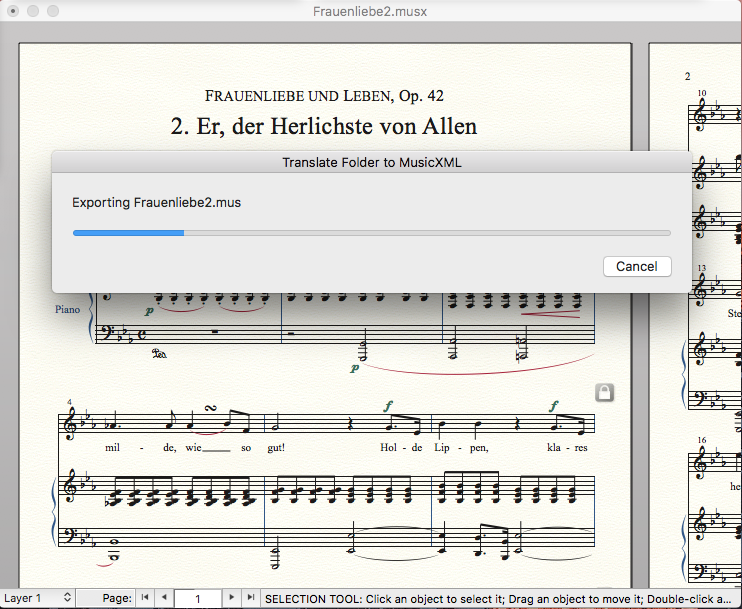 Finale 25.5 also has several improvements for translating folders of Finale or MusicXML files. First are improvements in the performance and reliability of these translations, especially for folders with large numbers of files. Next are the new “Include subfolders” options for export and import. These let you export or import files from not just a single folder, but all the subfolders within that folder. So if you have files in the My Scores, My Scores/Bach, and My Scores/Bach/CPE folders, you can translate a single My Scores folder and get all the files converted at once. We have also added work in progress dialogs that appear when translating a folder of Finale or MusicXML files. This dialog displays which file is currently being exported or import, and lets you cancel out of the folder translation once the current file is finished. With this version of the Dolet for Finale plug-in, we have removed support for Windows XP. Windows Vista or later are now required to run the Windows version of the Dolet 7.1 for Finale plug-in. Stay with the Dolet 7.0 for Finale plug-in if you are still using an older version of Finale on Windows XP. The Dolet for Finale plug-in is 32-bit only. Finale v25.5 includes all the added features that used to be part of the Dolet plug-in, plus some MusicXML features that only work in 64-bit Finale. With our 64-bit Finale v25, all the MusicXML functionality you need is available directly in the File menu. We hope that you find the improved MusicXML 3.1 and folder translation support will make moving your music files between applications even faster and more accurate than before. If you have issues using the MusicXML in Finale v25.5 or in using the Dolet plug-in, please let us know in theFinale portion of our Help Center. If you are a music notation software developer and find a problem with MusicXML 3.1 in your development work, please post an issue at the MusicXML GitHub repository. Today MakeMusic released Finale v25.4 and an updated Dolet 7.0 for Finale plug-in. Together with the new SmartMusic, these are the first commercial products supporting the MusicXML 3.1 format. MusicXML 3.1 is the latest version of the world’s standard interchange format for music notation, and the first to be developed at the W3C Music Notation Community Group. MusicXML 3.1 is still in beta test, but our implementation experience with Finale, Dolet, and SmartMusic made us confident that supporting it now would benefit our customers. Early implementations of new formats are encouraged in World Wide Web Consortium projects. This helps ensure that problems that do show up in real-life use are resolved before the standard is finalized. Ever since the earliest days of the MusicXML format, Finale support for MusicXML has driven adoption of the format and its new versions across the industry. We believe that the same thing will happen with MusicXML 3.1 – Finale’s support for the format will encourage other developers to adopt the features. For now, the biggest benefits to Finale customers will be in transferring MusicXML files from Finale to the new SmartMusic, and in transferring Finale files to older versions of Finale that pre-date the compatible .musx format (Finale 2009 to 2012). One other change is that uncompressed MusicXML files now have a .musicxml file extension, rather than the generic .xml file extension. This will allow applications to better distinguish MusicXML files from XML files used by other applications that might be on the same computer system. You can see all the updates to MusicXML in Finale 25.4 and Dolet 7 for Finale in the Dolet 7 for Finale version history. There are even more changes that MusicXML 3.1 makes possible that we plan to add in future Finale and Dolet updates. Note that the Dolet for Finale plug-in is 32-bit only. Finale v25.4 includes all the added features that used to be part of the Dolet plug-in, plus some MusicXML features that only work in 64-bit Finale. With our 64-bit Finale v25, all the MusicXML functionality you need is available directly on the File menu. We hope that you find MusicXML 3.1 will make moving your music files between applications even faster and more accurate than before. If you have issues using the MusicXML in Finale v25.4 or in using the Dolet plug-in, please let us know in theFinale portion of our Help Center. If you are a music notation software developer and find a problem with MusicXML 3.1 in your development work, please post an issue at the MusicXML GitHub repository. We are happy to announce that beta versions of the Dolet 7 for Finale plug-in are now available! You can download both the Mac installer and the Windows installer. Dolet 7 for Finale adds support for reading and writing MusicXML 3.1 files. MusicXML 3.1 is the latest version of the MusicXML format and the first one to be developed within the W3C Music Notation Community Group. By making Dolet 7 for Finale available for beta testing, we hope to assist other music software developers who want to add support for MusicXML 3.1 by being able to test exchanging MusicXML 3.1 files with Finale. Uncompressed MusicXML 3.1 files are now saved with a .musicxml file extension by default. Finale expressions with a mix of Maestro musical symbols and text are now exported and imported. Finale expressions with a mix of text and note symbols from other Finale built-in fonts are now exported. Unexpected symbols in Finale articulations can now be exported in a way that can be exchanged with other applications. Unexpected symbols in MusicXML files can now be imported into Finale articulations. Parenthesized accidental marks are now supported. Circled noteheads for percussion notation are now supported. The two styles of percussion clef are now distinguished during export and import. The n dynamic character is now supported. The sfzp and pf dynamics now use the corresponding new MusicXML elements. Highest / lowest notes without leger lines now use the standard MusicXML 3.1 feature for greater interoperability. Arrowhead characters in the Engraver Text fonts are now supported. Enclosures with 5 to 10 sides are now supported. The Dolet 7 for Finale plug-in is a 32-bit plug-in that works with Finale 2009 through Finale 2014.5 on Mac and Windows. Please share your experiences with MusicXML 3.1 and the Dolet plug-in at the W3C Music Notation Community Group. If you find a problem with MusicXML 3.1 in your testing, please post an issue at the MusicXML GitHub repository. Thank you for your help in making the MusicXML format an ever more powerful way to exchange scores between applications that use music notation. 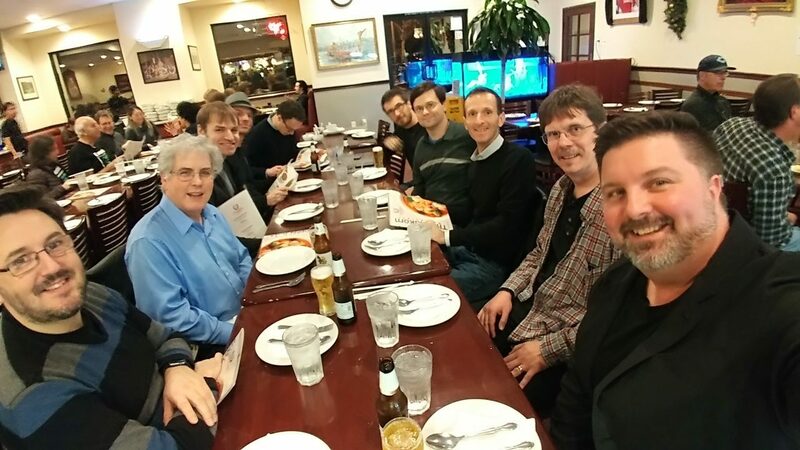 We held the second annual Musikmesse meeting of the W3C Music Notation Community Group on Friday, April 7 in Frankfurt. As in past years, we had about 40 people attending. Here are videos of the meeting taken by Peter Jonas. You can find the full meeting minutes, slides, and links to audio and video recordings on the W3C Music Notation Community Group blog. The first video includes the discussion of MusicXML 3.1 and SMuFL 1.2,. The second video includes the discussion of MNX, the Community Group’s project on a next-generation music notation standard. We are now planning to release MusicXML 3.1 and SMuFL 1.2 by the end of June 2017. MNX is a longer-range project. Please join the W3C Music Notation Community Group if you would like to participate in the development of these standards. Membership is free of charge and does not require membership in the W3C. Click the JOIN THIS GROUP button on the Community Group home page to get started. Today MakeMusic released version 25.3 of Finale and an updated Dolet 6.10 for Finale plug-in. Both releases include notable MusicXML improvements to both import and export. For import, Finale v25.3 adds a new MusicXML import preference, “Restrict MusicXML formatting”. This improves on the “Use current document if empty” preference added in Finale 25.2. When selected, the amount of formatting data imported from the MusicXML file is greatly restricted. This is especially true for document settings, system breaks, and page breaks. The formatting preferences for the current empty document are used instead. This preference is ignored if there is no document open, or the current document is not empty. MusicXML preferences are available in Finale v25 via the File menu. 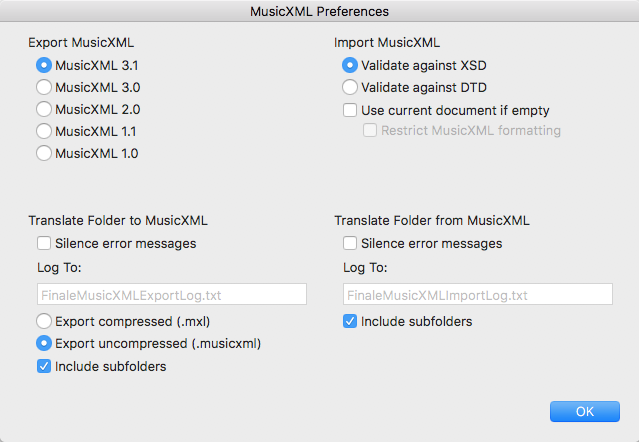 Choose either the Import or Export submenu and then select “MusicXML Preferences…”. The preferences are also available when using the Dolet for Finale plug-in with Finale 2014.5. In that case, go to the Plug-ins menu and choose the MusicXML submenu, then select “MusicXML Preferences…”. Finale v25.3 includes an additional 14 new features and fixes to MusicXML export and import support. Some of the most important ones are better export of expressions assigned to layers, better export of multimeasure rests. and better export of page-attached text. Dolet 6.10 for Finale includes all these improvements. You can read more about all these updates in our Dolet for Finale release notes. MusicXML in Finale v25.3 also supports the new 25.3 features. This includes the new options for short and long crescendo / decrescendo openings, and the new Unicode support for nonstandard key signatures and fretboard numbers. As with version 6.9, version 6.10 does not support Finale versions earlier than Finale 2009. This is due to the ongoing modernization of our software technology, especially for Mac platforms. If you are still using these older versions of Finale, we hope you will consider upgrading to the latest version. If not, please be sure to keep your current version of the Dolet plug-in. Also note that the Dolet for Finale plug-in is 32-bit only. Finale v25.3 includes all the added features that used to be part of the Dolet plug-in, plus some MusicXML features that only work in 64-bit Finale. With our 64-bit Finale v25, all the MusicXML functionality you need is available directly on the File menu. We hope that you find these new plug-ins help in moving your music files between applications. If you have issues with the plug-ins, please let us know in the Finale portion of our Help Center. Today MakeMusic released version 25.2 of Finale and an updated Dolet 6.9 for Finale plug-in. Both releases include notable MusicXML improvements to both import and export. Finale v25.2 includes the last of the features that had been available in the Dolet for Finale plug-in, but not in Finale v25. This is the ability to open an empty file, such as a template, and import your MusicXML file into that template. This makes it faster to reformat MusicXML files into your own favorite Finale styles. You can access this feature by setting the new MusicXML import preference “Use current document if empty”. Checking this option will import into the currently open file if possible – that is, if the file is empty and is open to a score rather than a linked part. This is the same behavior as the Dolet 6 for Finale plug-in. If you leave the option unchecked, the behavior is the same as in earlier versions of Finale – a new default document is opened and the MusicXML is imported there. Finale v25.2 includes an additional 12 new features and fixes to MusicXML export support. They include support for the Finale Copyist Text font as well as better export of metronome marks, compound dynamics, and chord symbols. Dolet 6.9 for Finale includes all these improvements, as well as most of the MusicXML improvements included in the original release of Finale v25. You can read more about all these updates in our Dolet for Finale release notes. As with version 6.8, version 6.9 does not support Finale versions earlier than Finale 2009. This is due to the ongoing modernization of our software technology, especially for Mac platforms. If you are still using these older versions of Finale, we hope you will consider upgrading to the latest version. If not, please be sure to keep your current version of the Dolet plug-in. Also note that the Dolet for Finale plug-in is 32-bit only. Finale v25.2 now includes all the added features that used to be part of the Dolet plug-in, plus some MusicXML features that only work in 64-bit Finale. With our 64-bit Finale v25, all the MusicXML functionality you need is available directly on the File menu.